As Indivisible members and groups, we’ve called our representatives all year demanding they stand up to the Trump administration and its repulsive agenda, with pretty damn impressive success. Right now, it’s time to call your member of Congress (MoC) and demand the federal government step up up to rebuild Houston over the long haul. You can check out Indivisible’s new policy explainer here. For more ways to help specific communities and a list of organizations working on the ground that you can donate to right now, check out my IndivisiBlog post. Today, our “We the People” agenda for our Members of Congress focuses on the economy. • The extreme right wing of the GOP wants draconian spending cuts added to the debt ceiling bill in return for its votes. (3) bipartisan, fair tax reform. “My name is [--] and I’m a constituent from [city], Oregon [ZIP code]. I am concerned about the risk posed to our economy by threats to default on our debt, shut down the government and pass unbalanced, unfair tax reform that primarily benefits the wealthiest. I am calling to ask that you pledge to protect our economy by insisting on a clean debt ceiling increase, a clean budget continuing resolution and bipartisan tax reform that is fair to working people. Thank you." Share this post with friends and family. And help them to call their own Members of Congress. Tell your MoC to stop any policy rider that weakens environmental laws in must-pass legislation, like the budget. Share this post with friends and family. Help them to call and tell their MoCs protect the environment. 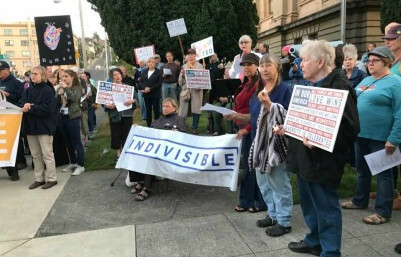 With Congress returning to DC next week, we at Indivisible Oregon are presenting our “We the People” agenda. Each day this week, we will communicate a top priority to our Members of Congress, and ask them to fight for it in September. Monday was healthcare. Today it’s civil rights. 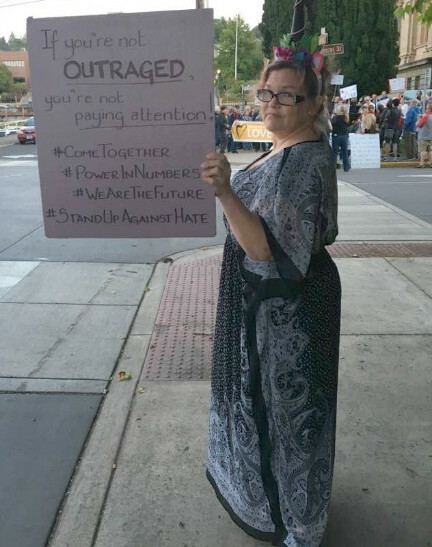 • Censure the President for sympathizing with Nazis, white nationalists and militias, and for denigrating the rule of law by pardoning Sheriff Joe Arpaio http://bit.ly/2wj1bjX. • End Trump’s election commission. By stoking “zombie” claims of voter fraud http://wapo.st/2vyPyEi the commission seeks to justify measures that suppress voting by minorities, students, the elderly and people with disabilities http://wapo.st/2vmffvB. • Restore protections in the Voting Rights Act that were gutted by the Supreme Court. It’s possible that the 2016 election was tilted by voter suppression, not voter fraud. Congress needs to strengthen the Voting Rights Act. Let’s keep our eyes on the prize. Ask our MoCs to stand up for equal rights, the rule of law and stronger civil rights protections! “Share” or copy / paste this action. From Indivisible Guide, our national resource. 1. Stand Up for the rule of law by condemning Trump's pardon of Joe Arpaio. He's the former Arizona sheriff who boasted of defying court orders, profiling Hispanics, fabricating causes for arrests, treating prisoners inhumanely, and neglecting the actual law enforcement duties of his office. One attorney says this pardon shows Trump's "presidential contempt for the Constitution.” Read more here and here. 2. Stand Up for DACA youth by co-sponsoring legislation that provides permanent relief to childhood arrivals. Read more here. 3. Denouce Trump's ban on transgender troops - an insult to all Americans, especially those who serve in the military. 4. Condemn Trump's increasing warlike talk and actions. He threatens war with North Korea, Venezuela, Afghanistan, and our trading partners. Google "Trump war talk" for more information. The '5 calls' app is a convenient way to make those calls. The app provides phone numbers and scripts so calling is quick and easy. Sign up here. 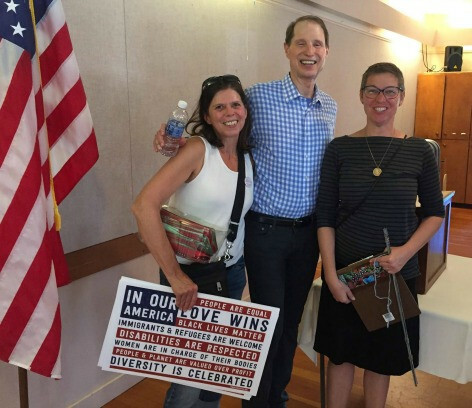 "In Our America" was the spirit at Senator Ron Wyden's Town Halls in Seaside and Manzanita (left , with Deb Vanasse, INCO co-leader; Senator Wyden, and Laura Rochelois, of Indivisible OR-1,) on August 25th. Full houses at both events, with spot-on questions, concerns, and outrage about this administration. Full determination to stay vigilant and work together to defend our democracy. Prep for 2018 by encouraging others to vote and practicing proven strategies for voter persuasion. At this INCO Vote the Future team meeting, we'll organize around a central tenet of democracy - every vote counts! This is a new team that welcomes everyone wanting to make positive change with INCO. Contact incoregon@gmail.com for location and directions. We are indivisible! 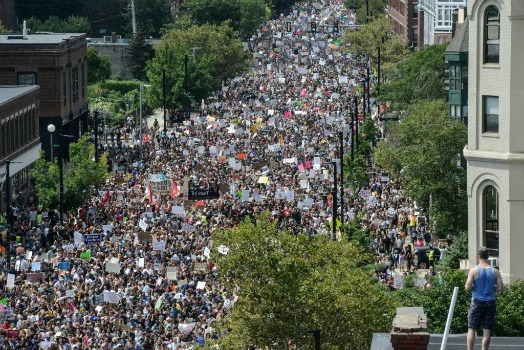 Some 40,000 people marched in Boston August 19th opposing the 100 white supremacists, Nazis, and KKK who claimed to be holding a "free speech" rally. Wednesday, August 30 - Vote the Future Team Organizing Meeting, 6:30 pm. Near Hwy 101 and Sunset Beach Road. Contact incoregon@gmail.com for location and directions. Saturday, September 16 - Immigration 101, 1 pm, Columbian Theater, 11th & Marine Drive, Astoria; presented by Oregon's Rural Organizing Project and hosted by Astoria INCO. 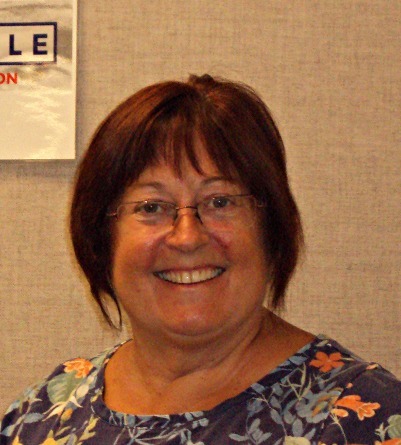 Saturday, September 23, Warrenton INCO monthly meeting, 11 a.m. Strategy session with Deb Vanasse. One-time venue change to accommodate everyone. Uptown Cafe meeting room, in Warrenton near Staples and Petco. Thursday, September 28 - INCO Book Club, 6:30 - 8 pm, member's home in Astoria. This month's book is NO IS NOT ENOUGH, by Naomi Klein. For location and more info, contact incoregon@gmail.com. Kate loves animals, graphic design, and parades. 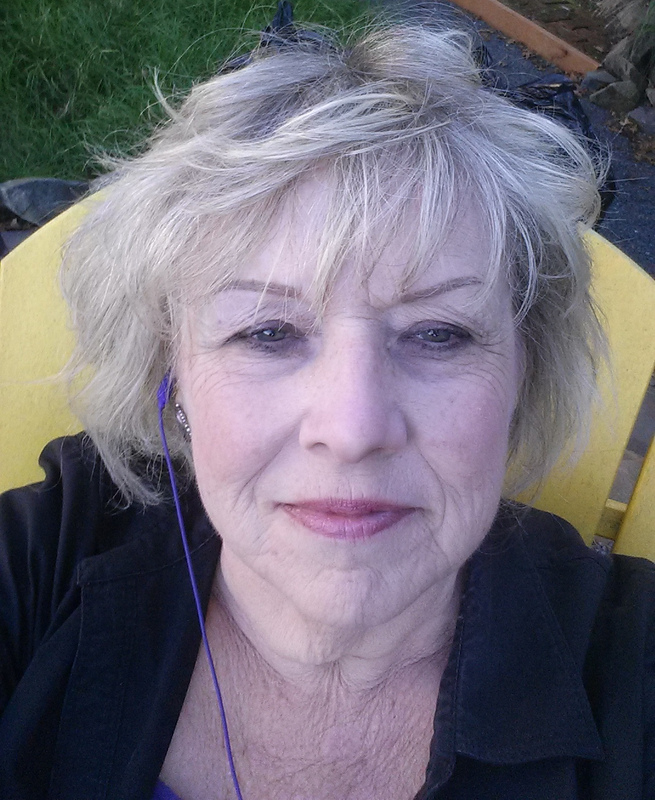 Read more about this INCO member who designed our Vote the Future banner here. "(Charles) Stover believed — and his life proves — that it is possible to make a difference in the world without yelling. It is easy to get caught up in the shouting of politicians, or to want simply to walk away from it all. That is why it is more important than ever to listen to the stories of those around us." - - Ariella Rosen, "A Whisper in an Age of Shouting"
What’s the Trump administration doing while Trump tweets and plays golf? Read about regulations, legislation, and budget and staff cuts here. Share this newsletter and our website with other resisters. They can join INCO here and find out about our closed Facebook page. With Congress returning to DC next week, we at Indivisible Oregon are presenting our “We the People” agenda. Each day this week, we will communicate a top priority to our Members of Congress, and ask them to fight for it in September. First up: healthcare. Republicans failed spectacularly at repealing Obamacare because of our resistance. As their attacks continue, we need to keep up the pressure. Trump continues to threaten to stop paying the subsidies to insurance companies, which are a core part of Obamacare. The CBO estimates that stopping these payments will increase premiums by 20% and the deficit by $194 million http://nyti.ms/2vGlNSE. Senator Graham's repeal bill would allow states to fund healthcare with block grants – getting the money by ending Medicaid expansion and private insurance subsidies http://bit.ly/2hl1hUu. Block grants are budget cuts in disguise http://lat.ms/1UhWnmW. Some Republicans are putting the health of almost 6 million kids on the line: they are threatening not to reauthorize the Children’s Health Insurance Program (CHIP) unless parts of Obamacare are repealed http://to.pbs.org/2hbyUIh. • CHIP expires on Sept. 30, just weeks after Congress reconvenes. • States will begin to run out of CHIP funds within weeks or months. Oregon's funds will dry up by March 31, 2018 http://bit.ly/2ixnCOU. Trump and the GOP are playing politics with our healthcare. Healthcare is a human right. Our Members of Congress must lead the charge to protect it. "My name is [--] and I’m a constituent from [city], Oregon, ZIP code [--]. I am very concerned about the GOP’s and Trump’s attempt to sabotage our healthcare to pay for tax cuts for the wealthy. Thank you for all you did to stop the ACA repeal. I am counting on you to lead the charge in Congress to fix the ACA and protect CHIP. We deserve quality healthcare for all." "My name is [--] and I’m a constituent from [city], Oregon, ZIP code [--]. I am very concerned about the GOP’s and Trump’s attempt to sabotage and take away our healthcare to pay for tax cuts for the wealthy. I remember your vote to repeal the ACA. You can make up for it by leading the charge in Congress to fix the ACA and protect CHIP. We deserve quality healthcare for all." Share this post with friends and family. And help them to call and tell their MoCs fix the ACA and reauthorize CHIP. When Congress reconvenes, they will be voting on Trump’s judicial nominees—vetted by Federalist Society, an organization that assists conservative students’ career path—including securing lifetime judicial appointments http://bit.ly/2wJDSC2. These biased nominees threaten our judicial branch. With filibuster’s elimination, confirmations need only 51 votes. Senators can veto outrageous choices through “blue slips”, but only for the senator's own state. 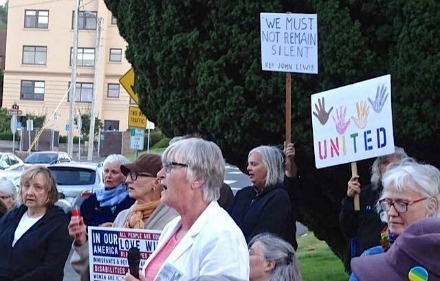 All available weapons must be used to preserve federal courts as impartial, legitimate branch of government, and to stop Trump’s racist agenda. Until Trump agrees to work with both parties to pick mainstream judges, our MoCs should put holds on all judicial nominees. If you can’t get to a town hall, please call Senators Wyden’s and Merkley’s office and ask them the above questions. Share this post with friends and family. And help them to call and tell their Senators put holds on all judicial nominees until Trump agrees to send judges with bipartisan credentials. The lack of funding for the 2020 census is the latest attempt by the GOP to suppress the voting power of minorities. The House and Senate Appropriations Committees have drastically underfunded the census, which will be devastating http://wapo.st/2uSrBLM. The GOP wants to keep control for the next decade. An underfunded census, the gutted Voting Rights Act, and Trump’s election fraud commission make this possible – at the expense of minority voters. The census and the right to vote are bedrock American ideals. We must fight guarantee these rights – for all communities. Our MoCs must fully fund the census, reinstate the voting rights act and disband Trump’s election fraud commission. My name is [--] and I’m a constituent from [city], Oregon, zip code [--]. I am very concerned about GOP voter suppression and underfunding the 2020 census. I ask you to do all you can to fully fund the census, reinstate the voting rights act and disband Trump’s election fraud commission. We must have free and fair elections in which every community can participate. Share this post with friends and family. And help them to call and tell their MoCs to fully fund the census, reinstate the voting rights act and disband Trump’s election fraud commission. I love the opportunity INCO has afforded to learn new skills—working with a blog and Facebook page in this instance. Joining up also represents a new social connection that’s at once stimulating and comforting. It’s a joy to be around so many like-minded people who’re bright, hard-working and very welcoming. I invariably come away from meetings and events with renewed energy and optimism. I’ve always been partial to Eleanor Roosevelt’s comment, “No one can make you feel inferior without your consent.” Her words reflect how we, as individuals, can so easily get in our own way as we go through life. I already knew a bit about INCO. Then I saw Deb Vanasse’ email looking for someone to maintain INCO’s Vote the Future page on Facebook and on their Indivisble North Oregon Coast blog. Communication—written and visual—is an area of interest (reflected in my work as a writer and graphic designer for assorted local publications and non-profits). With a bit of coaching up front, I felt I could help. Until joining INCO, I’d volunteered (and continue to do so) for nearly a decade--helping cats and dogs at the Animal Shelter in Warrenton and helping promote the Astoria arts scene, e.g., the North Coast Chorale, Tempo Gallery and Astoria Performing Arts Center, mainly. I confess to shying away from politics; they tended to be so controversial and effecting real change seemed too elusive. But my INCO affiliation has changed all that. It’s become clear that there’s real power in grassroots organizing and speaking out—we can make a difference! White Supremacist groups are armed, growing, and must be stopped. Congress must do its part by holding congressional hearings, reinstating funds for anti-domestic terrorism programs, and passing sensible laws to prevent gun violence. • Far right attacks outnumber those by Islamic terrorists by nearly 2:1 http://bit.ly/2uZQHs8. • DHS and the FBI recently warned Congress about the growing power of white nationalists http://cbsn.ws/2v98MAa. • Yet Trump proposes to cut funding to fight right wing violence http://bit.ly/2wyA32o . 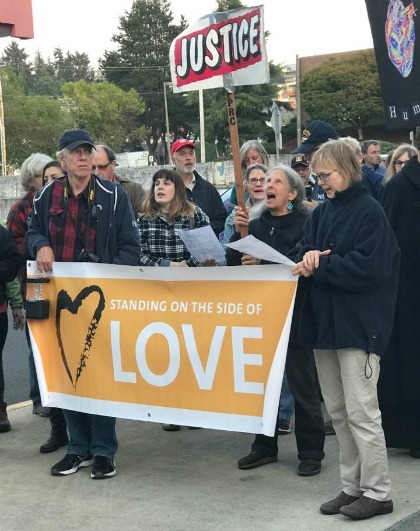 • 21 of the 36 Oregon sheriffs have signed an oath circulated by a militia group refusing to enforce new laws to prevent gun violence http://bit.ly/2xlHk2Y. 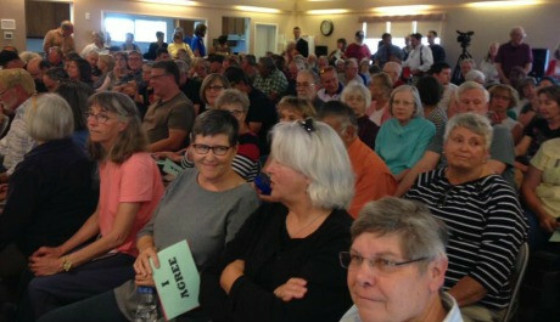 • The Multnomah County Republican Party has elected to allow local right-wing militias to provide security at their events http://bit.ly/2vj39yo. • White nationalist candidates nearly won local seats in Oregon’s 2016 election cycle http://bit.ly/2xlHk2Y. Republican leadership is avoiding hearings on the issue, but Democrats are organizing. http://politi.co/2viL6IV, http://politi.co/2x768ME . • Hearings on hate groups in the House and Senate committees on DHS and the Judiciary. • Federal funding to neutralize the influence of Nazi, racist and militia groups. “My name is [--] and I’m a constituent from [city]. I am very concerned about the rise of white nationalism, as seen at Charlottesville. We have a serious problem with white nationalism and hate groups in Oregon. What will you do to stop the growing power of militant hate groups, and disarm them? Thank you. Trump and GOP are scapegoating immigrants. They claim immigrants are violent criminals, take American workers’ jobs, and need to be forcibly removed. We need to act now to stop this anti-immigrant agenda. Ten GOP attorneys general are threatening to sue Trump if DACA isn’t dismantled by Labor Day http://politi.co/2u6IdLM. DACA provides protection for DREAMers (undocumented immigrant youth here since childhood) and grants relief from deportation. “My name is [--] and I’m a constituent from [city], Oregon [zip code]. Thank you for co-sponsoring the American Hope Act (HR.3591), I urge you to push for quick passage of this Act and the DREAM Act (HR.3440), so that young immigrants can continue to contribute to our society without fear of deportation. Thank you." “My name is [--] and I’m a constituent from [city], Oregon [zip code]. I am calling to express my support for the DREAM Act (HR.3440) and the American Hope Act (HR.3591). I urge you to push for votes on these bipartisan efforts to give those who arrived in the United States as children a path to permanent legal status and eventual citizenship. Thank you." “My name is [--] and I’m a constituent from [city], Oregon [zip code]. I am very concerned about Trump’s war against immigrants. I urge you to co-sponsor the DREAM Act (S.1615) and push for its quick passage. Please also stand firm against HR.3004 which criminalizes immigrants and benefits private prison corporations. Thank you." Stand up against Trump's sympathy for white supremacists, Nazis, and other bigots. 2. A boycott of companies that support Trump is having a big impact. Check out Grab Your Wallet for info and updates. 3. Write a Letter to the Editor (LTE) about an issue you care about, such as health care, education policy, the EPA, etc. LTEs are one of the most popular parts of newspapers, including the Daily Astorian. Write a paragraph or up to 350 words, and include your full name and contact info. Here are hints for writing an effective letter. Send your letter to editor@dailyastorian.com or via its website. 4. Get active with INCO's Anti-Bigotry Team and/or our Events Team. With your help, we can inform people, build bridges, and defeat hate. Contact incoregon@gmail.com. 1. Tell your Members of Congress to fight white supremacy policies - and the people in the White House who appear to support that agenda. Specific actions here. 2. Tell your Members of Congress to fight the Trump administration's work to dismantle and defund the EPA - and the health and safety of Americans. Specific actions here. 3. Tell your Members of Congress to work for a common-sense budget that reflects the priorities of Americans, not just the wishes of the 1% who back Trump and some of his key appointees. Specific actions here. 4. Tell your Members of Congress to use the correct labels for the bigots trying to call themselves "the alt-right." They are neo-Nazis, KKK, white supremacists, and white nationalists. Don't let them confuse Americans by trying to disguise their vicious, venomous, and hateful goals. We mourned at our vigil on August 13 for the horror at Charlottesville. This editorialbeautifully expresses our grief and our determination to reject and defeat bigotry in our communities. This map shows other vigils held around the country. Following a discussion in our Facebook group regarding a Confederate flag flown in our area, one of our INCO members wrote this to send to the property owners. She plans to include an American flag with the letter. Shared here with her permission, we offer it as a resource to those dealing with similar issues. 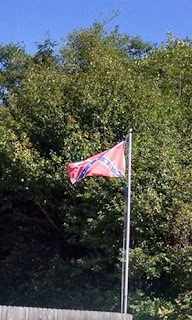 We wanted to talk to you about the Confederate flag that you’ve been flying. There is something special about flying a flag. It must harken back to the days of our forefathers when flags sent messages of hope and determination, or distress, or ownership. A raised flag has spirit and when it catches the wind, it is that much stronger. We can only assume that this particular flag means something special to you. Read more. Monday, August 21 - "Now is the Time", a free informational film about why healthcare for all is a financially sound decision for the nation; 6 pm, Adrift Hotel, 409 Sid Snyder Dr, Long Beach, WA, presented by Washington INCO. Thursday, August 24 - INCO Book Club, 6:30 pm, in Astoria. This month's book is Erich Fromm's “The Revolution of Hope: Toward a Humanized Technology." Contact Carolyn Eady at cebeady@outlook.com for information about location. Wednesday, August 30 - Vote the Future Team Organizational Meeting, 6:30 pm. Near Hwy 101 and Sunset Beach Road. Contact incoregon@gmail.com for more info. Kathleen organized Resistance School and keeps her cool despite a cantankerous computer/projector. Read more about this INCO community leader here. INCO is supported entirely by your donations. Your contribution will help provide the yard signs, buttons, printing, and other supplies INCO uses. A heartfelt THANK YOU to our donors! Donate here and on our website. Here's a spot-on guide for responding to hate and building community, from the Southern Poverty Law Center. Tell your FB friends they can also get our weekly INCO e-newsletters and emailed action alerts. Send email addresses and zip code to incoregon@gmail.com. Don't let Trump eclipse our democracy - or your energy and patriotism. Get involved with your INCO Community Group today in Manzanita-Cannon Beach, Seaside, Warrenton, Astoria, Washington Peninsula. Check out the resources on our website and on our Facebook page.